AIR ASSAULT-class Mjolnir, also designated as the MJOLNIR Powered Assault Armor/AA variant, is a MJOLNIR armor variant originally designed by Ushuaia Armory, with the GEN2 version being manufactured by the Naphtali Contractor Corporation. The GEN1 Air Assault helmet offers key advantages during airborne deployment scenarios. It has specialized optics that can provide real-time satellite imagery and enemy signature allocation. Air Assault was developed for use by UNSC Army airborne units. It was designed as an improvement to the ODST helmet and was heavily influenced by Ushuaia's previous work on the Marine Corps BDU. In 2535, after being tested at Ushuaia's Siófok Firing Range, the Air Assault helmet was introduced as a variant of the Mark IV MJOLNIR armor and was also adopted as the standard helmet of the UNSC Army's airborne division. In late 2551, the helmet was upgraded for use with the Mark V MJOLNIR system. After the first wave of GEN2 systems, based on requests of veteran Spartan-II and Spartan-III operatives, the UNSC Ordnance Commission considered reassessing a refined and upgraded version of the Mark V version of this suit. This led to the creation of the INTRUDER-class Mjolnir. Spartan Kat-B320 of NOBLE Team wore a Mark V AA helmet during the Battle of Fumirole and the Fall of Reach. During the Battle of Earth, ONI deployed security personnel with the Air Assault armor to prevent Covenant forces from gaining control of the skyhook defense complexes above Earth and Luna. Mark V Air Assault Helmet. The Air Assault helmet's superficial design remained largely unchanged during the transition from GEN1 to GEN2. The GEN2 Air Assault helmet is equipped with a long range integrated comm network. The new pauldrons seem to have succeeded the GEN1 FJ/PARA in design and function as they have a low-drag pauldron system. The chest has a locking retrieval brace. After the Human-Covenant War, the Naphtali Contractor Corporation began manufacturing the GEN2 version of the Air Assault helmet, as well as the matching torso armor and shoulder pieces. It was tested in the Buffalo Breaker Yards, and the Cascadian city of Mindoro. Air Assault met all of the UNSC Ordnance Commission strictures for ground combat. GEN2 Air Assault provides functional support across a number of colonies as well as remotely deployed combat units. This set is also primarily used by ONI security personnel on the skyhooks above Earth and Luna. The helmet is popular among Spartan fireteam leaders due to its communications system, though Napthali continues to market the helmet to the UNSC Army. Offshoots of the Air Assault armor have also been considered for adoption by unaugmented Delta-Six Division operators, but larger-scale adoption of the system has been hindered by its high cost, with each suit costing as much as a dropship. The MJOLNIR/AA variant was developed as an improvement of the venerable ODST helmet. Description: Entered service in 2535; the MJOLNIR/AA variant is exclusive to Army airborne units. Verge unlock: Complete the Vehicle Mastery commendation. Vision unlock: Purchase the Champions Bundle. This is not usable in Spartan Ops. Description: Primarily used by ONI security personnel on the skyhooks above Earth and Luna. Helmet description: The AIR ASSAULT helmet's long-range comm system makes it popular with Spartan fireteam leaders, but Naphtali also markets this helmet to Army special forces. Body description: AIR ASSAULT spin-offs were considered for adoption by unaugmented Delta-Six operators, but each suit costs as much as a dropship. The Air Assault helmet, (especially the GEN2 version), closely resembles the helmets worn by Orbital Drop Shock Troopers in Halo 2. The most prominent similarity is the faceplate, which is much less rounded than the version of the ODST helmet seen in post-Halo 2 media. The GEN2 Air Assault chestplate closely resembles that of the MJOLNIR Mark V, the [B] Variant specifically, and the similar Mark IV variant worn by Gray Team. Kat-B320 wearing her AA helmet. The Mark V Air Assault helmet as seen in the Armory of Halo: Reach. Kat wearing the AA helmet in combat. A damaged AA helmet near Aszod on Reach. High poly render of the GEN2 Air Assault armor for Halo 4. 3D render of Air Assault armor for Halo 4. A SPARTAN-IV wearing the GEN2 Air Assault armor. The Halo 4 Interactive Guide description. Frank Kodiak using GEN2 Air Assault armor in Halo: Hunters in the Dark. A Spartan-IV (far left) wearing Air Assault armor in the Halo 5: Guardians Multiplayer Beta. 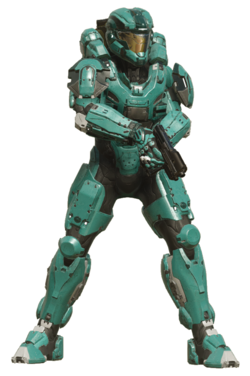 A Spartan-IV wearing Air Assault armor in Halo 5: Guardians. Air Assault in comparison to Intruder.